1364 passes her final days on the dump at Swindon in 1961 Copyright Ron Bowyer and used with permission. Yet another interesting [and useful] commission from Cornwall's Kernow Model Rail Centre is the tiny GWR 0-6-0 Saddle Tank from the 1361 Class, their latest release in a growing range of well-received and new-to-rtr models. However, unlike their previous releases, this tank was produced alongside an identical model from Heljan, with the Danish manufacturer pipping Kernow to the post. This sort of competition has been seen before, with both Hornby and Bachmann and Hornby and Oxford producing similar models at the same time. Never intentional clearly, it is not always to the benefit of the industry, although it does offer modellers the opportunity to exercise a more critical choice over which manufacturer's model to purchase. As a class, these little tanks were neither numerous nor particulalrly wide-spread. Only five were built and they spent most of their lives working in Devon and Cornawll [although one did spend its later days at St Philip's Marsh in Bristol and another spent some years at Swindon]. Built at Swindon in 1910 and attributed to Churchward [although most of the design work was undertaken by his junior, Harold Holcroft], none remained in service after 1962, with just one being purchased for preservation [1363, now to be seen at Didcot]. 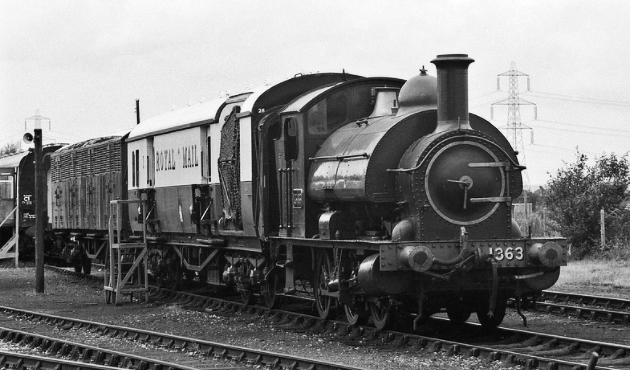 1364, the subject of the Kernow model and seen above, was withdrawn in 1961. The engines' short wheel-base [just 11 feet] and small wheels [3ft. 8ins.] were particularly suited to lightly-laid and sharply-curved track, a feature which made them ideal for use in Plymouth's Millbay and other docks and on some of Cornwall's branchlines. One of the class  was also used on the Weymouth Harbour Tramway, fitted with a bell. 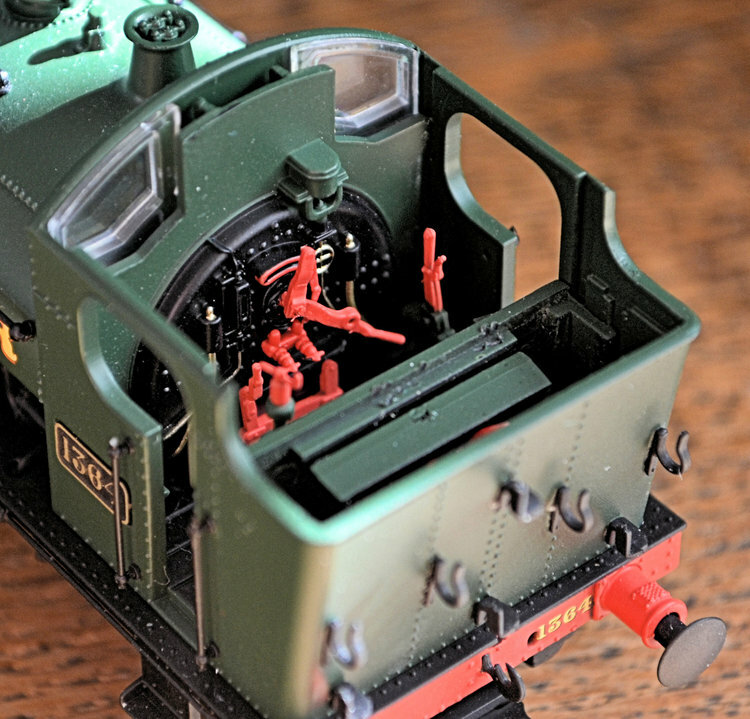 With Heljan's version alongside, no earlier r-t-r model of this tank has been available in 'OO'. Kit versions have preceded it of course and Keyser's white-metal offering frequently appears on eBay. In 'O' gauge, Tower Models produced a Korean brass r-t-r version. BR Black, late crest & weathered. As well as there being a number of versions of the model, there are also significant detail differences between each of them, reflecting the changes which took place during their lives [eg. handrail and tank vent positions, different shaped buffer shanks and cab roof details, etc. ], with Kernow's website correctly observing that one tooling alone cannot capture all of the variety. The Heljan models appear not to allow for this variation, the main reason for the Kernow release being my preference. Modellers' decisions are so often subjective however and it will be for each purchaser to decide which of the releases they prefer. Produced in conjunction with the Great Western Society at Didcot, Kernow donates £5 from every sale of the tank to the GWS as a contribution towards the restoration of the Class survivor, 1363. 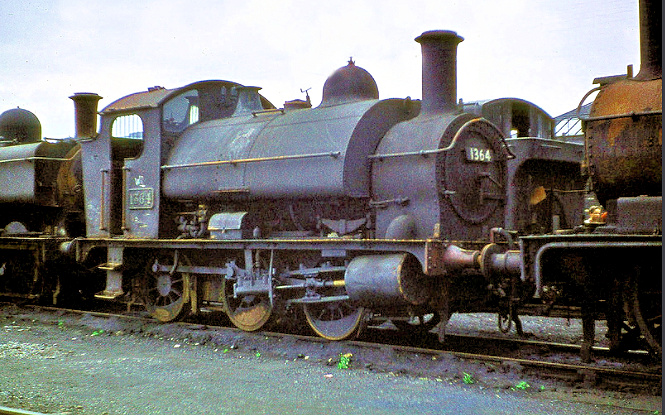 1363, the sole survivor of the Class, at Didcot in the 1970s. Wikimedia Commons / copyright Barry Lewis. Straight from the box, Kernow advises the usual period of gentle running-in and light lubrication of moving parts to achieve optimum performance. This done, the model ran silently and very smoothly, was responsive to control [on analogue] and although weighing only around 135 gms. it should be an ideal shunting loco. Whilst straightforward, the livery is neatly applied with the reversing rod and cab details picked out in red and the wheels and motion a darkened steel colour. Brake rodding is fitted with brake shoes applied, correctly, to the centre and rear drivers only. NEM couplings are fitted and all buffers are sprung. The cab detail is quite comprehensive although difficult to see fully without first removing the roof and the coal load. The cab captures the spacious, airy appearance of the original and looks far more modern that its 1910 origins would suggest. The large forward windows, essential for running on tightly-curved and congested dock lines, are neatly glazed, as are the rear, behind their protective rails. The bunker contains a removable coal load and the rear is fitted with lamp irons and hooks for firing irons. An etched number plate is fitted to the lower cab side-sheet, positioned in a slight recess. This has been the subject of some criticism on modelling forums but, in the view of the reviewer, it is not problematic. If modellers felt that this method of attachment did jar, a simple and effective remedy would be to glue an etched brass number plate over the original. The photographs show that the original is quite neat however. Moving along the running plate, a number of details immediately strike the eye. Separately fitted wire handrails are present and have been carefully applied, the plating for the saddle tank is well-riveted and splashers appear on the running plate above the driving wheels. The rivets have been criticised for being too large. Looking at the photographs and the model, it struck me that this was simply a criticism too far: in strict scale terms they may be too large but in reality they look fine from any angle. Comment about the splashers is more difficult to avoid however as they shouldn't be there at all. They are not cosmetic in this case and provide clearance for the wheel-flanges. They are more obvious on the right hand side than the left and were clearly modelled in the belief that they were present. At the smoke-box end, the smoke-box door lifts out to reveal the access point for a decoder. The photograph shows the neat magnetic fixing and removal and refitting is simplicity itself. Within the packaging are two accessory bags containing an etched fret of fire-irons and a set of running lamps, buffer-beam pipes and a dummy coupling. The lamps have fixing sockets and so can be attached to represent a number of workings. So, having acknowledged the issue of the splashers, Kernow's tank remains a pleasing and welcome addition to the range of Great Western locomotives now available. Whilst this is not a comparative review, as mentioned earlier it scores over the Heljan model for me because various detail differences between the Class members are modelled. This is a model which I'm sure will begin to be seen on many dock-side or harbour branch layouts and, given the range of liveries available, it can run through a wide time range. Kernow are to be congratulated for commissioning this interesting newcomer.